Digital Xbox One version reviewed. This review does contain spoilers. 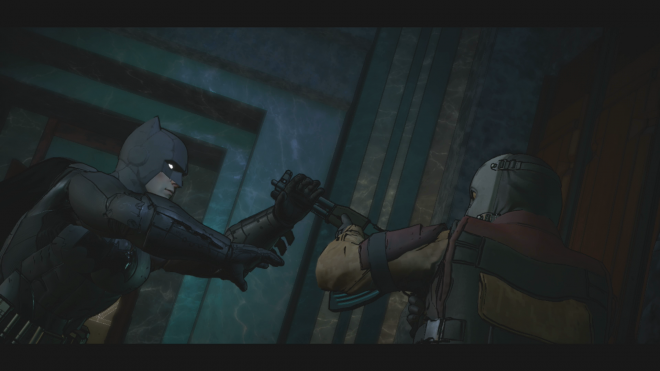 Telltale's 'Batman' has been rolling out much quicker than their usual series (except for 'Minecraft'), with the fourth and penultimate episode 'Guardian of Gotham' dropping less than four months since the first episode. In comparison, 'The Wolf Among Us' needed almost a year. Previous episodes of 'Batman' consist of 'Realm of Shadows', 'Children of Arkham', and 'New World Order'. The fifth and final outing is scheduled for release sometime in January. Bruce Wayne's freedom and fortune are both circling the drain. Last episode he beat Penguin (the new CEO of Wayne Enterprises, somehow) into a bloody pulp after being injected with a nasty drug, an act that landed him firmly in Arkham Asylum. As if that wasn't bad enough, Mayor Harvey Dent has betrayed Wayne, initiating a police manhunt and seizing the manor. Things are looking grim on the Bat side too, as the Children of Arkham have grown beyond the caped crusader's ability to stop them. 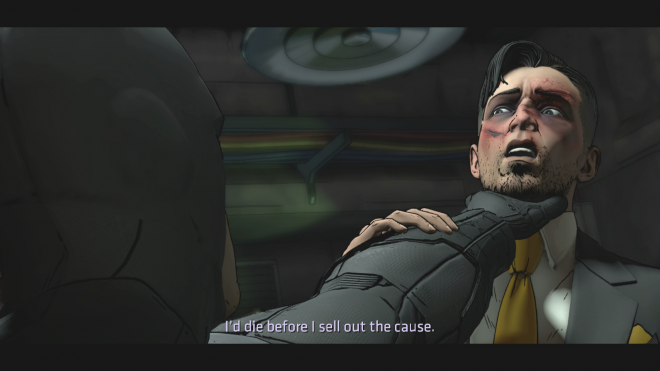 Telltale's stories often look hopeless by this point in a series, and Wayne is closer to ruin than we've seen thus far. It reminds me somewhat of 'The Dark Knight Rises', where Wayne is a disabled hermit with a shrinking trust fund, and Batman has disappeared after being blamed for the murder of Harvey Dent. 'Guardian of Gotham' isn't quite as dark or engaging as that film, but it wants to paint a similarly depressing portrait of Gotham City. It's a Gotham where Wayne and the Bat are usually one step away from total destruction, emerging occasionally not so much to claim victory over the forces of evil, but only stop their progress for a short time. Batman is outmatched, an underdog despite his awesome training and technology, and struggles to keep himself afloat most of the time, much less the rest of the city. It is very different from the empowering rock 'em sock 'em 'Arkham' series, where the hero can take down a dozen armed thugs in seconds. This dynamic is working pretty well for Telltale's series. It keeps me on my back foot, always struggling to gain some advantage in conversations and decisions, but hammering me no matter what I choose. However, as I mentioned in the review for the previous episode, there does have to be some kind of balance with player choice. 'Batman' is probably the weakest Telltale series I have played in that regard, in that it matters so little which choices I make. In stark contrast to 'The Walking Dead', a more or less linear experience with major player choices along the way, 'Batman' is just a more or less linear experience. At least it still has surprises, not the least of which is the way they're using Vicki Vale. I won't discuss that one except to say that she's not the tiny supporting role or damsel in distress she is usually depicted as. Almost all of the characters have had very surprising outcomes and origins. There is an underlying string tying everyone together, and that's abandonment. Wayne and at least two of his adversaries are orphans, and he has reacted to his family situation in a very different way than they have (of course, he's also been insanely wealthy his whole life). All three of them often act like children do, desperate for approval and petulant when challenged. It is a subtle but increasingly noticeable subtext in this series, and we'll see if Telltale is actually able to make something of it in the last episode or let it drift off into oblivion. The sound is nearly as bad as the video. I played almost the entire episode with no syncing from the voice acting or sound effects, leading to an almost comically unprofessional display, not unlike a bootleg. Even if I was interested in experiencing the story again, the visual performance would soon convince me otherwise. The writing team is doing a decent job with the direction and script of 'Batman: The Telltale Series', but the severely strained engine rears its ugly head at every opportunity. Telltale's formula and tech both are very familiar by now and have their flaws, which we've been able to overlook for the sake of an otherwise enjoyable story. The lag has nearly reached a critical mass, however.